Children recently orphaned by Haiti's earthquake could be targeted for organ trafficking, Haiti's prime minister says. 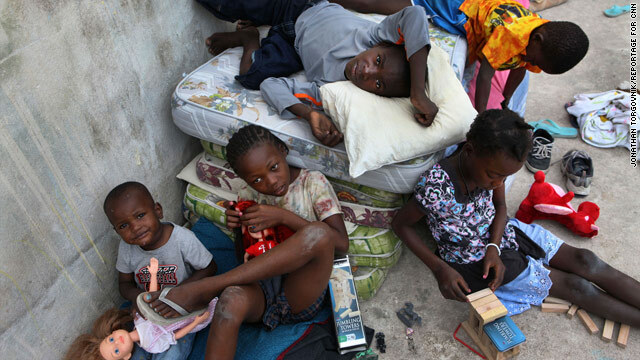 (CNN) -- Trafficking of children and human organs is occurring in the aftermath of the earthquake that devastated parts of Haiti, killed more than 150,000 people, and left many children orphans, Haitian Prime Minister Jean-Max Bellerive said Wednesday. "There is organ trafficking for children and other persons also, because they need all types of organs," Bellerive said in an exclusive interview with CNN's Christiane Amanpour. He did not give specifics, but asked by Amanpour if there is trafficking of children, Bellerive said, "The reports I received say yes." Haiti is trying to locate displaced children and register them so they can either be reunited with other family members or put up for adoption, Bellerive said. But, he said, illegal child trafficking is "one of the biggest problems that we have." Many groups appear to be legitimate, "but a lot of organizations -- they come and they say there were children on the streets. They're going to bring them to the [United] States," he said. Bellerive said he's trying to work with embassies in Port-au-Prince to protect Haiti's children from traffickers. "Any child that is leaving the country has to be validated by the embassy under a list that they give me, with all the reports," he said. Speaking at his temporary headquarters in a police station near the Port-au-Prince Airport, Bellerive said the first thing Haitian officials seek to confirm is whether the children have adoption papers before they leave the country. In Washington, the State Department said Wednesday it is moving cautiously on the issue of adoptions from Haiti. "We want to be sure that when a child has been identified, that due diligence has been done to make sure that this is truly an orphan child and not a child that actually has family," said State Department Spokesman P.J. Crowley. "Sometimes if you push too hard, too fast there can be unintended consequences. So we are being very, very careful." "We respect the sovereignty of Haiti and their right to control the departure of Haitian children. So we think the system that has been established is working effectively. I know there is a perception out there of 'cut through the red tape.' But there are very good reasons we want to make sure this process works well," Crowley said. On the broader issue of Haitian children, Bellerive told Amanpour the government will reopen schools Monday in most of the country. He said there were particular problems in Port-au-Prince. "We cannot open one school and not the other. But some of the schools want to operate right now. They say if there are tents -- if there are facilities and we can help them -- they are willing to open very rapidly." Bellerive also highlighted the critical importance of getting enough tents and shelters to Haiti before the rainy season begins in May. He said he didn't know where all the tents promised by aid agencies and governments are. "We have reports that they've already sent 20,000 tents maybe, and 20,000 more are on the way. But yesterday, when we didn't see the tents and we didn't see any action to organize the shelters, the president himself asked to see the storage place and we only counted 3,500 tents." Bellerive said President Rene Preval asked for 200,000 tents to house between 400,000 and 500,000 people. "We are very preoccupied about the consequences of all those people on the street, if it starts to rain." The prime minister also rejected criticism from within Haiti and overseas that his government needs to be more visible to the Haitian people. "We are in charge. Frankly I don't understand what that position is that we are not visible," he said. "I almost feel that I spend more time talking to radio, television, than I am working." "I know it's part of my job and I have to communicate. But I really feel that I have spent too much time doing that." Bellerive also said he does not believe it's necessary to relocate the capital to another part of Haiti. "I have to wait for technical and scientific evaluation, but from what I've heard until now, Port-au-Prince will stay there." "Tokyo is still there, Los Angeles is still there. We just have to prepare a better constructed Port-au-Prince, a safer Port-au-Prince," he said. He also acknowledged the need for more transparency and new procedures to prevent corruption in Haiti. But he said 70 to 80 percent of the aid coming to the country right now does not go through the Haitian government. Bellerive said about 90 percent of American aid, for example, goes through non-governmental organizations. "They are accountable to the American government, but not to the Haitian government," he said. The prime minister told Amanpour that he does not believe people overseas are helping Haiti out of a moral obligation. "I believe it's a more pragmatic responsibility," he said. "I believe Haiti could be an interesting market in the midterm. We are 10 million [people] here and it's a market."